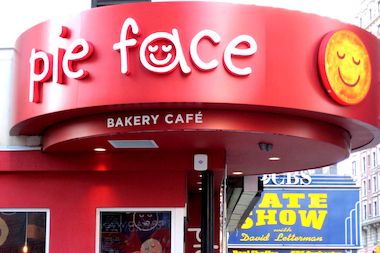 UNION SQUARE — Pie Face quietly closed six out of its seven New York City branches after rapidly expanding over the past three years. The Australian pie and coffee chain suddenly shuttered its Union Square, Chelsea, Murray Hill and Midtown outposts with no explanation except paper signs saying catering was still available at the Hell's Kitchen Pie Face location at 36th Street and Ninth Avenue, which will remain open. Pie Face did not return calls for comment. It was not immediately clear when each location closed, but upset New Yorkers began tweeting about the shutdowns late last week. “@PieFaceNYC USQ location closed? #sadface,” tweeted Eric Fitzgerald on Oct. 10. The cafes that shuttered were located at West 53rd Street and Broadway; 509 Third Ave. near East 34th Street; 13th Street and Fourth Avenue; West 46th Street and Eighth Avenue; Seventh Avenue and West 35th Street; and 169 W. 23rd St. In most of the closed locations, the Pie Face signs and interiors were intact, but the outpost at Seventh Avenue and West 35th Street was gutted as of Wednesday afternoon. An employee at the West 36th Street and Ninth Avenue cafe — the last Pie Face still open in the city — confirmed that all the other stores would remain closed, but declined to comment further. YC Media, the public relations firm that used to represent Pie Face in the United States, no longer works for the Australian chain, according to an employee at the company who declined to give her name. Pie Face has not responded to the many people who asked for information about the closures on social media. “@PieFaceNYC What’s going on? Are You pulling a Crumbs? Yr Fans want to know!” tweeted Ellen Scordato on Oct. 11. She also posted an Instagram photo of a sign posted in the window of the Murray Hill location, which said: "After 10 p.m. tonight there will be no more Pie Faces in NY. Sorry Guys!" Pie Face — known for its sweet and savory pies and Aussie coffee — opened its first U.S. location in 2011 on the corner of West 53rd Street and Broadway, near the Ed Sullivan Theater. It opened at least one location every year after, with the most recent ones launching in Chelsea and Union Square last year.